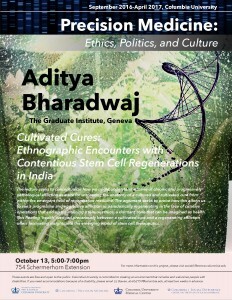 CSSD’s Precision Medicine working group presents Aditya Bharadwaj, Research Professor, The Graduate Institute, Geneva, on “Cultivated Cures: Ethics, Politics, and Culture Ethnographic Encounters with Contentious Stem Cell Regenerations in India” on October 13th, 2016 from 5-7 p.m. at 754 Schermerhorn Extension. The lecture seeks to conceptualize how we might understand a scene of chronic and progressively pathological affliction as a site for witnessing the anatomy of a cultured and cultivated cure from within the emergent field of regenerative medicine. The argument seeks to probe how this allows us to see a progressive and aggressive affliction as paradoxically regenerating in the face of curative operations that end up maintaining a tenuous truce, a dormant zone that can be imagined as health. This fleeting ‘health’ wedged precariously between a cultivated cure and a regenerating affliction offers fascinating insights into the emerging world of stem cell therapeutics.